Aarhus University is the first university in the Nordic Region to integrate their CRM Solution with LinkedIn. After the implementation of Mira’s LinkedIn Integration 1600 members have connected their profile to LinkedIn. The university’s goal is that 50% of the members are going to use the integration – and they are already close. Aarhus University is one of the biggest universities in the Nordic Region. External Relations is extremely important and the alumni organization has to build good relations to the university’s alumni. One parameter that is extremely important, is to contain information about the alumni’s career. The University’s CRM Solution contains Mira ERM BASE and Mira Alumni Relations. And recently they were the first university in collaboration with Mira Network to integrate their CRM Solution with LinkedIn. Jacob Jensen at Aarhus University was the initiator and internal Project Manager. – Before we maintained Mira’s LinkedIn Integration, we had actually been pushing for it for a long time. We knew that we could get more and better data to our CRM system from LinkedIn. The CRM that we use is a really important tool to manage the university’s external relations, says Jacob Jensen, Team Leader at Aarhus University. Before the official launch of the integration, Jacob and his team sent out a test to 1000 alumni who were the first to use the integration. 300 people signed up, the university practically got no negative feedback, and the users said that this was a good idea. This made Jacob feel comfortable to proceed with a bigger campaign. – We did a major campaign to all of our members, and over two weeks, 1600 persons connected their profile to LinkedIn. A goal for us is that 50% of our members use the LinkedIn Integration. Before the end of the half-year of using it, we will be close to that number. We are planning more campaigns, and we always promote the integration when we send out information to new members, says Jacob Jensen, Team Leader at Aarhus University. Aarhus University’s goal is to always have updated information about all their members. 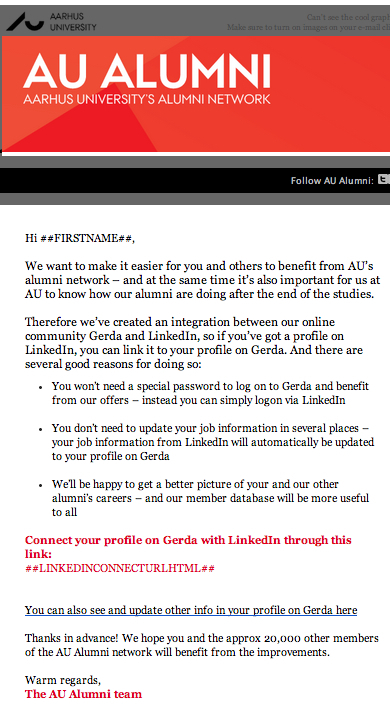 Mira’s LinkedIn Integration simplifies this, and in the future the university will have extremely good quality about the alumni’s job information. Jacob tells us that the integration is beneficial to all of those who work with the alumni information, and that it provides a lot of value. He also says that it has ben well received from the university’s alumni – and that he definitely would recommend it to other organizations.